Heart and Soul was composed back in 1938 by Hoagy Carmichael. It’s been covered numerous times over the years and appeared in the 1988 Tom Hanks movie Big in a famous scene where Hanks and Robert Loggia play the tune on a toy floor piano. This ukulele arrangement was kindly provided by David Lawson (regular readers will know that name as he’s contributed two arrangements in the past – The Walking Dead theme and The Scientist by Coldplay). I actually didn’t know this song by name at all. I only knew it from Big. It wasn’t until I started playing through the tab below that I recognised it. David’s arrangement isn’t too tricky to play and shouldn’t pose too many problems particularly if you’ve done a little bit of fingerpicking in the past. Two of the first four bars don’t require you to fret any notes at all (which is rather nice). It gets a little tricker around the 6th bar but take it slowly and you’ll work your way through it without too many problems. I’d highly recommend slowing the video down and mimicking David’s fretting hand position throughout. If you’re not sure how to slow the video down, hit the cog button at the bottom right and choose the speed option (this is really helpful when you’re watching people play ukulele). 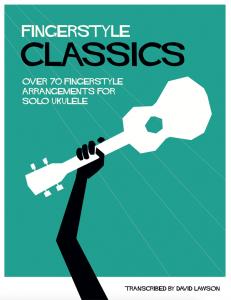 This arrangement was taken from David’s ebook Fingerstyle Classics which contains over 70 solo ukulele arrangements (like this one) for just $18. There are supporting videos for the arrangements to help you learn. Absolutely beautiful, hopefully one day I’ll be able to play like that, but I guess that’s a long way off as I have just started to learn to play the Ukelele and I’m struggling but really enjoy your lessons.